Miniature horses are wonderful family pets, good investments, and fit into almost any lifestyle. Appealing to all ages, miniatures are easy to train and even easier to fall in love with. Except for being ridden a miniature can do almost everything their larger relatives do only on a smaller scale. A miniature although cute and friendly is a horse…….. Some people have their minis help around the farm, pulling carts and small garden equipment. Miniatures can be found visiting schools, hospitals, and children's centers all over the United States. A mini can’t be ridden but they can pull two adults in a cart. A youngster can easily be taught to drive along with mom or dad. There are miniature shows all over the country. Most of the larger shows have over 100 classes for exhibitors of all ages. Shows include youth, amateur, and open divisions. Minis’ show in halter, trail, jumping, showmanship, hunter, pleasure driving, roadster, and costume classes. There is even miniature harness racing.......sound like fun? 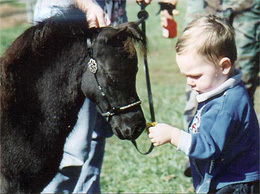 There are about 90,000 registered miniature horses in the United States today. There are two main registries for minis. AMHA and AMHR. AMHA is the largest. Both associations help keep track of pedigrees, registrations, show points, various club activities, and they help promote miniature horses. There are many individual clubs across the United States that offer help, shows, socializing, and miniature horse activities for the whole family. Miniatures are about 16-18” tall when they are born. They have very fluffy soft coats. They nurse for about 4-5 months but will begin to nibble hay after just a few weeks. A full grown mini will weigh 275-350 pounds. Miniatures are a height breed. They are 38”” or under. In the breed you will find all types and colors. Some will look like Quarter horses, Arabians, Morgan's or sleek Thoroughbreds. What ever your preference you will find it in the miniature horses breed. Miniatures vary in price from pet quality to show or breeding stock. Prices start from about $1500 and can go up to $20,000 or more depending on quality. 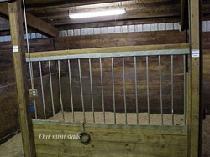 Minis are easy to care for, however they do need adequate fencing, good shelter, nutritious food and clean water. Minis eat about one bale of hay per month. Some minis get grain in addition to their hay. Usually they get 1/2 to one cup per feeding, depending on their age and use. 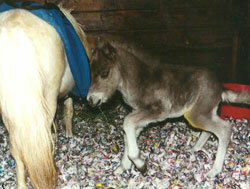 Minis do tend to over eat so a well planned diet is needed to keep them in good shape. Regular shots and worming keeps them healthy. Minis need to have their feet trimmed about every 2-3 months. They do not wear shoes. Show horses get trimmed about every 5 weeks. Minis have very thick coats in winter and sometimes in summer it is a good idea to clip it off for comfort. Minis are eager to please and with a few lessons in handling can be the perfect family pet!